June marks the start of “Adopt A Shelter Cat Month,” meaning that thousands of cats throughout the country will be able to find their new forever home thanks to caring and thoughtful owners. However, just like dogs, cats continue to be readily available for individuals to purchase at pet store chains, many of which are bred in less than ideal conditions. For this reason, in today’s article, we will be taking a look at a few of the many reasons why you should adopt a cat! At Loveland Veterinary Clinic, we have offered the best veterinary services in Loveland since 1949, and we continue to do so today. From routine blood work and vaccinations to ultrasounds and pet x-rays, we offer both basic and specialized services alike. We are staffed by a team of Doctors of Veterinary Medicine that are dedicated to their craft, and they are backed by capable and qualified Veterinary Technicians. So whether it’s your first time visiting Loveland Veterinary Clinic, or your pet is a returning patient, you can rest easy knowing that your pet is in good hands. 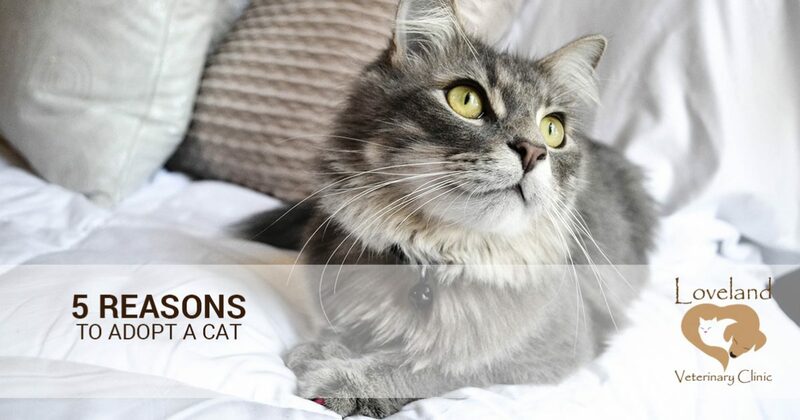 To learn more about some of the reasons why you should consider adopting a cat, continue reading more on the subject below. According to The American Society for the Prevention of Cruelty to Animals, “approximately 1.5 million shelter animals are euthanized” each year. Although this approximation has decreased from 2.6 million animals euthanized in 2011, there is still much work to be done to ensure that animal euthanization remains as infrequent as possible. By choosing to adopt a cat from your local animal shelter, you can ensure that you are doing your part in helping save a life while also adding a new furry friend to your family. If you are wanting to get a cat for yourself or your family, then you may be looking at the costs of doing so. From litter and cat food to toys and flea medicine, there are a number of ways that having a cat as a pet can become costly. However, buying a cat from your local pet store will typically cost far more than adopting a cat from your local animal shelter. Not only will your adopted cat be up to date on his or her vaccinations, but they will also be spayed or neutered, saving you an additional cost that you would have had to account for otherwise. Teaching a cat to use their litter box can be frustrating, especially if your furry friend is already resistant to the idea. This can make cleanup a daily routine, requiring you to spend an ample amount of time looking after your cat. However, by adopting a cat from an animal shelter, you can be sure that your newest addition to the family will respect your house rules, as many of the cats at animal shelters are already litter-box trained! If you are wanting to do your part by helping cats throughout the country, there is no better way of doing so than by adopting from your local animal shelter. Once a cat has been adopted from an animal shelter, it opens up more space for your local animal shelter to care for more cats. Not only will you be helping your furry friend by providing them with a warm and welcoming home, but you will also be helping stray cats that may require special care at your local shelter. One of the most notable reasons that individuals end up adopting cats over dogs is that cats are far more independent than dogs. When left to their own devices, cats require very little attention, making them the perfect pet for those with busy work schedules. That’s not to say, however, that your cat won’t want to snuggle up next to you after you return home from a long day of work! These are just some of the many reasons why you should consider adopting a cat from your local shelter during “Adopt A Shelter Cat Month.” However, if you are interested in having your newly adopted cat brought in for a general wellness check, then don’t hesitate to get in touch with our team of veterinary professionals today.